Growth regulator larvicide for oral medication. 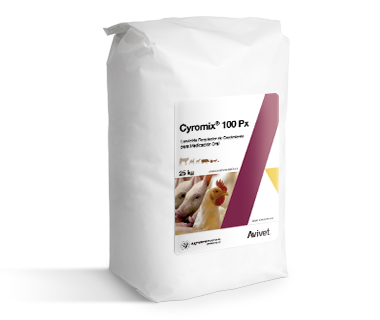 Cyromix® 100 Px is a medicated premixes that contains a synthetic insect growth regulator that acts by inhibiting shedding and pupation. Food additive for the control of fly larvae (Stable fly: Stomoxys calcitrans, Horn fly, Haematobia irritans, small housefly Fannia canicularis, fly of poultry manure Fannia pusio, house fly, domestic fly, fruit fly Drosophila melanogaster) and fleas in birds (Hen fleas Echidnophaga gallinacea, human fleas Pulex irritans). Poultry: 500 g per ton of food for two periods of 4 to 6 weeks, with an interval of 4 to 6 weeks without treatment. To reduce the population of flies immediately, Cyromix® 100 Px and an adulticide such as No-Fly should be applied. In organic matter: 1000 g per ton of material to be treated. After spreading the product it is recommended to stir the treated material.